Comments: Evergreen broadleaf native to Japan. Low growing tree/bush with large deeply lobed glossy green leaves. 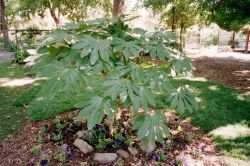 Mature plant to 8'. Likes sheltered shady location. White flowers and black berries in summer and fall.